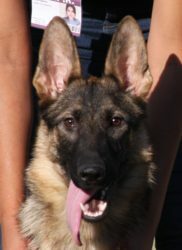 Isa trained young German Shepherd Female for sale. Absolutely stunning pigment, dark sable color. Her pedigree is a combination of the so called show lines from German (not to be mistaken with American show lines) and West German working bloodlines. We have practiced combining the two strains multiple times with great outcome. Isa is currently in the advanced in home training program receiving the best training by the best trainers available here at Zauberberg Kennels. She is a medium energy dog that is well socialized and gets attention anywhere she goes. © 2017 ZAUBERBERG! - All Rights Reserved.